Blaseg KD, Daugherty P, Gamblin KA, eds. Oncology Nurse Navigation: Delivering Patient- Centered Care Across the Continuum. Pittsburgh, PA: Oncology Nursing Society; 2014. Freeman HP, Rodriguez RL. History and principles of patient navigation. Cancer. 2011;117(15 Suppl):3539-3542. doi: 10.1002/cncr.26262. IOM Report: Delivering high-quality cancer care: charting a new course for a system in crisis. www.iom.edu/qualitycancercare. September 2013. Oncology Nursing Society. Oncology Nursing Society Multicultural Outcomes: Guidelines for Cultural Competence. Pittsburgh, PA: Oncology Nursing Society; 2000. Shockney LD. Becoming a Breast Cancer Nurse Navigator. 1st ed. Sudbury, MA: Jones & Bartlett Publishers; 2011. Shockney LD. Evolution of patient navigation. Clin J Oncol Nurs. 2010;14(4):405-407. Shockney LD, Haylock PJ, Cantril C. Development of a breast navigation program. Semin Oncol Nurs. 2013;29(2):97-104. Itano JK, Taoka KN. Core Curriculum for Oncology Nursing. Pittsburgh, PA: Oncology Nursing Society; 2005: Chapters 5, 22. Palos GR, Hare M. Patient, family caregivers, and patient navigators: a partnership approach. Cancer. 2011;117(15 Suppl):3592-3602. doi: 10.1002/cncr.26263. Canosa R, Gentry S. Helping your patients manage chemotherapy-induced nausea and vomiting. Journal of Oncology Navigation & Survivorship. 2012;3(5):22-26. Delibovi D. Preventing and managing CINV: evolving strategies to improve patient care. Journal of Oncology Navigation & Survivorship. 2013;4(6 Suppl):4-11. Desimini EM, Kennedy JA, Helsley MF, et al. Making the case for nurse navigators―benefits, outcomes, and return on investment. Oncol Issues. 2011:26-33. Faiman B. Classifying and managing pain in the oncology patient. Conquering the Cancer Care Continuum. Journal of Oncology Navigation & Survivorship. 2013;2-6. Lester JL, Schmitt P. Cancer Rehabilitation and Survivorship: Transdisciplinary Approaches to Personalized Care. Pittsburgh, PA: Oncology Nursing Society; 2011. Sauer A. Malnutrition in patients with cancer: an often overlooked and undertreated problem. Journal of Oncology Navigation & Survivorship. 2014;5(1):24-25. Shockney LD, Tsangaris TN. The Johns Hopkins Breast Cancer Handbook for Health Care Professionals. Burlington, MA: Jones & Bartlett Learning; 2008. Shockney L. Navigation needs for breast health and breast cancer populations of low- and middle- income countries. Journal of Oncology Navigation & Survivorship. 2013;4(1):21-31. Shockney L, Silver J, Bantug E, Sweet L, Mayer R, Friedman M. Healthcare providers knowledge of the benefits of cancer rehabilitation. Journal of Oncology Navigation & Survivorship. 2013;4(2):12-17. Treacy JT, Mayer DK. Perspectives on cancer patient education. Semin Oncol Nurs. 2005;16:47-56. Tschanz JA, Sugarman C. Carcinogenesis. In: Itano JK, ed. Core Curriculum for Oncology Nursing. St. Louis, MO: Elsevier; 2016. Yarbo CH, Wujcik D, Gobel BH. Cancer Nursing: Principles and Practice. Sudbury, MA: Jones & Bartlett Learning; 2010: Chapters 4, 5, 10, 26, 27, 70. Jones RA, Steeves R, Ropka M, Hollen P. Capturing treatment decision making among patients with solid tumors and their caregivers. Oncol Nurs Forum. 2013;40(1):E24-E31. doi: 10.1188/13.ONF.E24-E31. Mann KS. Education and health promotion for new patients with cancer. Clin J Oncol Nurs. 2011;15(1):55-61. doi: 10.1188/11.CJON.55-61. MacDonald H. Relational ethics and advocacy in nursing: literature review. J Adv Nurs. 2007;57(2):119-126. doi: 10.1111/j.1365-2648.2006.04063.x. Pillay T, van Zyl HA, Blackbeard D. Chronic pain perception and cultural experience. Procedia - Social and Behavioral Sciences. 2014;113:151-160. Tariman J, Berry D, Cochrane B, et al. Physician, patient and contextual factors affecting treatment decisions in older adults with cancer: a literature review. Oncol Nurs Forum. 2012;39(1):E70-E83. doi: 10.1188/12.ONF.E70-E83. Vaartio-Rajalin H, Leino-Kilpi H. Nurses as patient advocates in oncology care: activities based on literature. Clin J Oncol Nurs. 2011;15(5):526-532. doi: 10.1188/11.CJON.526-532. Shared decision making among individuals with cancer in non-Western cultures: a literature review. Culture's Effects on Pain Assessment and Management. Cultural aspects in communication of cancer care. American College of Surgeons Commission on Cancer Standards 2015. Cancer Program Standards 2012, Version 1.2.1: Ensuring Patient-Centered Care [Educational standards]. www.facs.org/quality-programs/cancer/coc/standards. 2014. Bush NJ. Coping and adaptation. In: Psychosocial Nursing Care Along the Cancer Continuum. 2nd ed. Pittsburgh, PA: Oncology Nursing Society; 2009:71-88. Carroll-Johnson RM, Gorman LM, Bush NJ. Psychosocial Nursing Care Along the Cancer Continuum. Pittsburgh, PA: Oncology Nursing Society; 2006. Dossey BM, Keegan L. Holistic Nursing: A Handbook for Practice. 6th ed. Sudbury, MA: Jones & Bartlett; 2012. Hamer M, Chida Y, Molloy G. Psychological distress and cancer mortality. J Psychosom Res. 2009;66:255-258. http://dx.doi.org/doi:10.1016/j.jpsychores.2008.11.002. Kaplan M. SPIKES-a framework for breaking bad news to patients with cancer. Clin J Oncol Nurs. 2010;14:514-516. http://dx.doi.org/ PMID: 20682509. O'Donnell E. The distress thermometer: a rapid and effective tool for the oncology social worker. Int J Health Care Qual Assur. 2013;26:353-359. http://dx.doi.org/http://dx.doi.org/10.1108/09526861311319573. Salsman J, Pearman T, Cella D. Quality of life. In: Psychological Aspects of Cancer: A Guide to Emotional and Psychological Consequences of Cancer, Their Causes and Their Management. 2013: 255-278. [Adobe Digital Version]. http://dx.doi.org/DOI 10.1007/978-1-4614-4866-2. Sivesind D, Paire S. Coping with cancer: patient and family issues. In: Psychosocial Dimensions of Oncology Nursing Care. 2nd ed. Pittsburgh, PA: Oncology Nursing Society; 2009:1-28. American Cancer Society. www.cancer.org/treatment/finding-and-paying-for-treatment/understanding-financial-and-legal-matters/americans-with-disabilities-act.html. 2016. American College of Surgeons Commission on Cancer (CoC) Survivorship Care Planning - Standard 3.3. www.facs.org/publications/newsletters/coc-source/special-source/standard33. National Hospital and Palliative Care Organization. www.nhpco.org/history-hospice-care. Aaronson N, Mattioli V, Minton O, et al. Beyond treatment – psychosocial and behavioural issues in cancer survivorship research and practice. EJC Suppl. 2014;12(1):54-64. doi: 10.1016/j.ejcsup.2014.03.005. Detering KM, Hancock AD, Reade MC, Silvester W. The impact of advance care planning on end of life care in elderly patients: randomized controlled trial. BMJ. 2010;340:c1345. Dow LA, Matsuyama RK, Ramakrishnan V, et al. Paradoxes in advance care planning: the complex relationship of oncology patients, their physicians, and advance medical directives. J Clin Oncol. 2010;28:299-304. Emmons KM, Sprunck-Harrild K, Puelo E, de Moor J. Provider advice about smoking cessation and pharmacotherapy among cancer survivors who smoke: practice guidelines are not translating. Trans Behav Med. 2013;3:211-217. doi: 10.1007/s13142-013-0202-7. Hawkins ML, Buys SS, Gren LH, et al. Do cancer survivors develop healthier lifestyle behaviors than the cancer-free population in the PLCO study? J Cancer Surviv. 2017;11:233-245. doi: 10.1007/s11764-016-0581-0. Higginson IJ, Sen-Gupta GJ. Place of care in advanced cancer: a qualitative systematic literature review of patient preferences. J Palliat Med. 2006;20(4):447-453. www.ncbi.nlm.nih.gov/pubmed/?term=4.%09Higginson+IJ%2C+Sen-Gupta+GJ.+Place+of+care+in+advanced+cancer. Jones J, Nowels C, Kutner JS, Matlock DD. Shared decision making and the use of a patient decision aid in advanced serious illness: provider and patient perspectives. Health Expect. 2015;18:3236-3247. www.ncbi.nlm.nih.gov/pubmed/25439268. Kirk TW, Luck GR. Dying tax free: the modern advance directive and patients’ financial values. J Pain Symptom Manag. 2010;39:605-609. Mowls DS, Brame LS, Martinez SA, Beebe LA. Lifestyle behaviors among US cancer survivors. J Cancer Surviv. 2016;10:692-698. doi: 10.1007/s11764-016-0515-x. Murphy KM, Nguyen V, Shin K, et al. Health care professionals and the employment-related needs of cancer survivors. J Occup Rehabil. 2017;27:296-305. doi: 10.1007/s10926-016-9629-2. Pfirstinger J, Kattner D, Edinger M, et al. The impact of a tumor diagnosis on patients’ attitudes toward advance directives. Oncology. 2014;87:246-256. Pizzi MA. Promoting health, wellness, and quality of life at the end of life: hospice interdisciplinary perspectives on creating a good death. J Allied Health. 2014;43(4):212-220. www.ncbi.nlm.nih.gov/pubmed/25433185. Ramsey S, Blough D, Krichhoff A, et al. Washington state cancer patients found to be at greater risk for bankruptcy than people without a cancer diagnosis. Health Aff. 2013;32(6):1143-1152. Sep MS, Osch M, van Vliet LM, et al. The power of clinicians' affective communication: how reassurance about non-abandonment can reduce patients' physiological arousal and increase information recall in bad news consultations. An experimental study using analogue patients. Patient Educ Couns. 2014;95(1):45-52. Shockney L. Fulfilling hope: supporting the needs of patients with advanced cancers. Nova Science. 2014:50, 109, 111, 124. Smith L, Hall IJ. Advancing health equity in cancer survivorship: opportunities for public health. Am J Prev Med. 2015;49(6 Suppl 5):S477-S482. doi: 10.1016/j.amepre.2015.08.008. Surbone A, Halpern MT. Unequal cancer survivorship care: addressing cultural and sociodemographic disparities in the clinic. Support Care Cancer. 2016;24:4831-4833. doi: 10.1007/s00520-016-3435-4. Walling AM, Asch SM, Lorenz KA, et al. The quality of supportive care among inpatients dying with advanced cancer. Support Care Cancer. 2012;20(9):2189-2194. www.ncbi.nlm.nih.gov/pubmed/24126685. Weitzen S, Teno JM, Fennell M, et al. Factors associated with site of death: a national study of where people die. Med Care. 2003;41(2):323-335. www.ncbi.nlm.nih.gov/pubmed/?term=weitzen+teno+factors. Wright AA, Keating NL, Balboni TA, et al. Place of death correlations with quality of life of patients with cancer and predictors of bereaved caregivers' mental health. J Clin Oncol. 2010;28(29):4457-4464. Accreditation Committee Clarifications for Standards 3.1 Patient Navigation Process and 3.2 Psychosocial Distress Screening. www.facs.org/publications/newsletters/coc-source/special-source/standard3132. Advisory Board Company. Realizing the promise of navigation. Nursing Executive Center. 2011:38-39. American Nurses Association Code of Ethics for Nurses. www.nursingworld.org/MainMenuCategories/EthicsStandards/CodeofEthicsforNurses/Code-of-Ethics-For-Nurses.html. AONN+ Community Forum. Benchmark for navigator/patient ratio. https://aonnonline.org/forum/navigator-resources/36-benchmark-for-navigatior-patient-ratio. AONN+ Community Forum. https://aonnonline.org/forum/bc-navigator-resources/64-tracking-patients. https://aonnonline.org/forum/navigator-resources/27-charting. AONN+ Webinar. Cancer Prehabilitation: Navigators May Improve the Patient Experience and Survivor Outcomes by Julie Silver, MD. 2014. Blaseg K. Patient navigation at Billings Clinic: an NCI community cancer centers program (NCCCP) pilot site. ACCC's Cancer Care Patient Navigation: A Call to Action. Rockville, MD: Association of Community Cancer Centers; 2009:15-24. Braun KL, Kagawa-Singer M, Holden AE, et al. Cancer patient navigator tasks across the cancer care continuum. J Health Care Poor Underserved. 2012;23(1):398-413. doi: 10.1353/hpu.2012.0029. Brown CG, Cantril C, McMullen L, et al. Oncology nurse navigator role delineation study: an Oncology Nursing Society report. Clin J Oncol Nurs. 2012;16(6):581-585. Calcutt-Flaherty J, Gentry S, Mathis L. Supporting evidence based practice in nurse navigation. Abstract at AONN+ 5th Annual Conference, September 2014. Campbell C, Craig J, Eggert J, Bailey-Dorton C. Implementing and measuring the impact of patient navigation at a comprehensive community care center. Oncol Nurs Forum. 2010;37(1):61-68. doi: 10.1188/10.ONF.61-68. Case MA. Oncology nurse navigator: ensuring safe passage. Clin J Oncol Nurs. 2011;15(1):33-40. doi: 10.1188/11.CJON33-40. Christensen D, Bellomo C. Using a nurse navigation pathway in the timely care of oncology patients. Journal of Oncology Navigation & Survivorship. 2014;5(3):13-18. Desimini EM, Kennedy JA, Helsley MF, et al. Making the case for nurse navigators―benefits, outcomes, and return on investment. Oncol Issues. 2012:26-33. Doll R, Barroetavena M, Ellwood A, et al. The cancer care navigator: toward a conceptual framework for a new role in oncology. Oncol Exchange. 2007;6(4):28-33. Espinosa A, Gabel M, Vlahakis P. Patient navigation: defining metrics that support and justify the nurse navigator role. Journal of Oncology Navigation & Survivorship. 2012;3(5):16-20. Fillion L, de Serres M, Cook S, et al. Professional patient navigation in head and neck cancer. Semin Oncol Nurs. 2009;25(3):212-221. doi: 10.1016/j.soncn.2009.05.004. Fillion L, Cook S, Veillette A, et al. Professional navigation framework: elaboration and validation in a Canadian context. Oncol Nurs Forum. 2012;39(1):58-69. doi.org/10.1188/12.ONF.E58-E69. Fiscella K, Ransom S, Jean-Pierre P, et al. Patient-reported outcome measures suitable to assessment of patient navigation. Cancer. 2011;117(15):3603-3617. doi: 10.1002/cncr.26260. Freeman H. A model patient navigation program. Oncol Issues. 2004;19:44-46. Gamblin K, Blaseg K. Documentation and patient navigation software. In: Blaseg KD, Daugherty P, Gamblin K, ed. Oncology Nurse Navigation Delivering Patient-Centered Care Across the Continuum. Pittsburgh, PA: Oncology Nursing Society; 2014:275-295. Gentry S. Advanced navigation (5+ years). Presentation at Fifth Annual AONN+ Conference. Gentry S, Sellers J. Navigation considerations when working with patients. In: Blaseg KD, Daugherty P, Gamblin KA, eds. Oncology Nurse Navigation Delivering Patient-Centered Care Across the Continuum. Pittsburgh, PA: Oncology Nursing Society; 2014:71-120. GW Cancer Institute's Online Academy. http://smhs.gwu.edu/gwci/education. Harvard Business Review. How Patient Navigation Can Cut Costs and Save Lives. 2013. https://hbr.org/2013/03/how-patient-navigation-brings. Heaslip P. Critical thinking and nursing. www.criticalthinking.org/pages/critical-thinking-and-nursing/834. 2008. Hook A, Ware L, Siler B, Packard A. Breast cancer navigation and patient satisfaction: exploring a community-based patient navigation model in a rural setting. Oncol Nurs Forum. 2012;39(4):379-385. doi: 10.1188/12.ONF.379-385. Hunnibell L, Rose M, Connery D, et al. Using nurse navigation to improve timeliness of lung cancer care at a veterans hospital. Clin J Oncol Nurs. 2012;16(1):29-36. doi.org/10.1188/12.CJON.29-36. Johnston D. Current state of care transitions and cancer survivorship. Journal of Oncology Navigation & Survivorship. 2013;4(4):11-20. Knowlton S, Silver A, Silver J, McKitrick L. Can nurses provide assessments and interventions for prehabilitation? A survey study of cancer rehabilitation service line coordinators. Journal of Oncology Navigation & Survivorship. 2014;5(4):44. Koh C, Nelson J, Cook P. Evaluation of a patient navigation program. Clin J Oncol Nurs. 2011;15(1):41-48. doi.org/10.1188/11.CJON.41-48. Mack N, Shalkowski L. How to start and expand a nurse navigation program. In: Blaseg K, Daugherty P, Gamblin K, eds. Oncology Nurse Navigation Delivering Patient-Centered Care Across the Continuum. Pittsburgh, PA: Oncology Nursing Society; 2014:43-70. National Cancer Institute Head and Neck Cancers. www.cancer.gov/cancertopics/factsheet/Sites-Types/head-and-neck. Oncology Nursing Society Oncology Nurse Navigator Core Competencies. www.ons.org/sites/default/files/ONNCompetencies_rev.pdf. Raedler L. Cancer program Standards 2012 R1.2. Navigation and Survivorship: What's Happening in the Field? Journal of Oncology Navigation & Survivorship. 2013;4(6):16-19. Raedler L. Community needs and navigation. Journal of Oncology Navigation & Survivorship. 2014;5(3):39-42. Seek A, Hogle W. Modeling a better way: navigating the healthcare system for patients with lung cancer. Clin J Oncol Nurs. 2007;11(1):81-85. doi.org/10.1188/07.CJON.81-85. Silver A, Knowlton S, Silver J, McKitrick L. Cancer rehabilitation service line directors perceive navigators as having value on multidisciplinary rehabilitation teams and identify 3 barriers to improving their care. Journal of Oncology Navigation & Survivorship. 2014;5(4):43. Swanson J, Koch L. The role of oncology nurse navigator in distress management of adult in-patients with cancer: a retrospective study. Oncol Nurs Forum. 2010;37:69-75. Efird JT, Landrine H, Shiue KY, et al. Race, insurance type, and stage of presentation among lung cancer patients. Springerplus. 2014;3:710. Miles RE, Snow CC, Meyer AD, Coleman HJ Jr. Organizational strategy, structure, and process. Acad Manage Rev. 1978;3(3):546-562. Scott N, Crane M, Lafontaine M, et al. Stigma as a barrier to diagnosis of lung cancer: patient and general practitioner perspectives. Prim Health Care Res Dev. 2015;16(6):618-622. Vinas F, Ben Hassen I, Jabot L, et al. Delays for diagnosis and treatment of lung cancers: a systematic review. Clin Respir J. 2016;10(3):267-271. Bleich M. The Institute of Medicine report on the future of nursing: a transformational blueprint. AORN J. 2013;98(3):214-217. Cunning S. The only constant is change…make it last with process improvement. Nurs Manage. 2014;45:15-17. Ferrell B, McCabe M, Levit L. The Institute of Medicine report on high-quality cancer care: implications for oncology nursing. Oncol Nurs Forum. 2013;40(6):603-609. Gantz P. Institute of Medicine report on delivery of high quality cancer care. J Oncol Pract. 2014;10(3):193-195. Hemman E. Meeting effective care measures. Am J Nurs. 2011;111(12):54-60. Institute of Medicine. Delivering High-Quality Cancer Care: Charting a New Course for a System in Crisis. Washington, DC: National Academies Press; 2013. Rees S, Leahy-Gross K, Mack V. Moving data to nursing quality excellence. J Nurs Care Qual. 2011;26(3):260-264. Schaffer MA, Sandau KE, Diedrick L. Evidenced-based practice models for organizational change: overview and practical applications. J Adv Nurs. 2013;69(5):1197-1209. Sherrod D, McKesson T, Mumford M. Are you prepared for data-driven decision making? Nurs Manag. 2010;41(5):51-54. Sprayberry LD. A response to the transformation of America's health care: direct-care nurses bring FLOWERS to the bedside. Medsurg Nurs. 2014;23(2):123-130. Stevens KR. The impact of evidenced-based practice in nursing and next big ideas. Online J Issues Nurs. 2013;18(2):4. Strusowski T, Sein E, Johnston D. Academy of Oncology Nurse & Patient Navigators announces standardized navigation metrics. Journal of Oncology Navigation & Survivorship. 2017;8(2):62-68. Strusowski T, Stapp J. Patient navigation metrics. Oncol Iss. 2016;31(1):62-69. Your ONN-CG℠ is valid for 3 years from the date of testing. 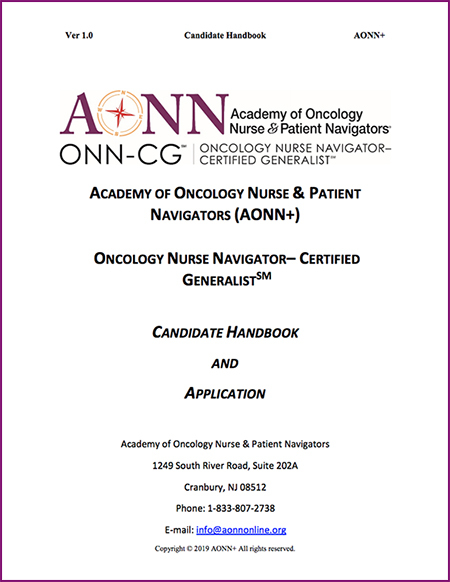 To maintain your Oncology Nurse Navigator–Certified Generalist℠ (ONN-CG℠) credential, you must document participation in 45 continuing education hours every 36 months. For a list of AONN+ continuing education offerings, please click here.